Is There One Bike Better Than All the Rest? Which are the Best Sport Touring Motorcycles? This is a question that I get asked all the time, especially when approached by people on the road. They want to know which motorcycle will provide the most comfort on a long road trip, yet be sporty enough to do the curves and twisty roads. As is the case with all things motorcycle, I don't think that this question can be answered universally. I don't believe that there is ONE sport touring motorcycle that is better than all the rest - but there is probably one sport touring motorcycle that would be best for you. Almost all motorcycle manufactures have a sport touring model - a bike that has the ability to carry luggage, and is intended to be more comfortable than the average purely sport bike. With the exception of the cruiser models, most of these motorcycles tend to be bigger in terms of seat height, width, and most importantly weight. There is no doubt about it - a sport touring motorcycle with a front faring is going to weigh more than one without a faring. The faring is there for protection and wind buffering, but it makes the front end much heavier. The key is to find a model that will allow for comfort, and yet is still one that you can easily control. You really do need to be able to "right" the front end of any bike that you choose to ride. Maybe you are concerned about what might be the Best Sport Touring Motorcycle for a woman? Here are some handy specifications for some popular motorcycles for women. 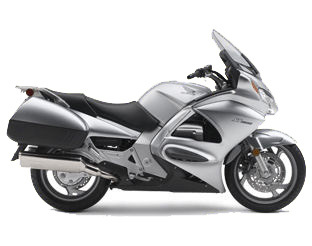 Honda classifies the Gold Wing as a "touring" model, while the ST 1300 (formerly the ST 1100) is a "sport touring" motorcycle. But, is either model one of the Best Sport Touring Motorcycles? The 1832cc SOHC liquid-cooled horizontally opposed six-cylinder Gold Wing is not for beginners; this is not a little bike. BUT, I do know women who ride "wings" and love them. I know men who now have Gold wings just so that their wives get to ride in the utmost comfort. Whatever the reason, this is the motorcycle designed for comfort. There is a special "comfort package" as an option, and reverse can be done electronically. So, if you desire comfort above all other things, this may be the bike for you. The seat height is 29.1 inches, do-able for shorter riders. I have tried to "right" the front end of a Gold Wing, and I was able to, although it was challenging for my short-waisted, although tall body. On the other hand, the ST 1300 is a handsome choice, and a very quick and nimble sport tourer. With a dry weight of 650 pounds, and a seat height of 31.1 inches, this is a sport touring motorcycle that I could be very comfortable on. The engine: a 1261cc liquid-cooled longitudinally mounted 90-degree V-4, and the 5 speed transmission is perfect for some major touring. I know a few guys who have this bike, and they absolutely love it. Only one color choice per year, but who cares? With a base price of a little over $14,000, this motorcycle is a great choice, especially when compared to the rather hefty price tag of a BMW RT. Buying a new Sport Touring Motorcycle? The experience of purchasing a new motorcycle can be daunting, especially for a woman motorcycle rider. No surprise, BMW has five models that it classifies as sport touring motorcycles: The F 800ST, K 1200GT, K 1200LT, R 1200RT, and the R 1200ST. Of the two, the F 800ST is probably the best value and all around great touring and sport bike, but I heard rumors at the 2007 BMW rally that this model is being discontinued due to poor sales. With a MSRP of approximately $11,000, this is an affordable option for someone who wants a BMW that is comfortable and sporty. Other than the price, what do I like about this motorcycle? 4. Riding position - it's definitely not a completely upright position, enough of a sport feel to make it fun! I also like the R 1200ST, particularly when compared to the much heavier R 1200RT. The ST has the same engine displacement, but a much smaller and lighter front end. I have not yet test ridden this motorcycle, but it is definitely on my list. I will not be surprised to see a number of women riders on this motorcycle at the 2008 BMW MOA Rally in Montana. This particular model must be specially ordered through your dealer. Does the fact that it must be specially ordered mean that it is one of the Best Sport Touring Motorcycles? Find your own Sport Touring motorcycle. 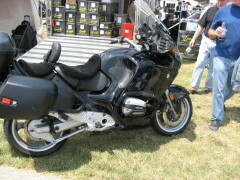 Ebay Motors is a great place to check out used BMW motorcycles. especially models that are no longer available. 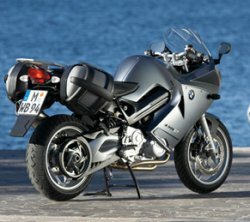 Of the three other models, The K1200 GT is known as the fastest motorcycle ever made by BMW, and the heavy front end would keep it out of my stable. But, in terms of horsepower, this baby would have to be one of the Best Sport Touring Motorcycles. The K 1200LT, is the equivalent to the Honda Gold Wing, in terms of comfort, size and options, but with a MRSP of over $21,000, you need to be really serious to consider this model. This is like a Lexus on two wheels - nice, but maybe when I'm older. 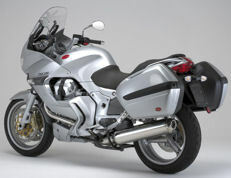 Perhaps when I'm in my seventies, the K 1200LT will get my vote for one of Best Sport Touring Motorcycles - but not yet. And, perhaps, the gold standard in sport touring models is the R 1200RT. This is a NICE motorcycle, and truly comfortable. I rode our rented RT in England, and was surprised at its ability to be nimbly thrown around in the curves, given the size of the front. After riding my R1100 S sport bike, I did feel a bit like I was riding a mini-van, but the experience left me thinking that someday, I could ride a RT full-time. For most of our last trip, I rode on the back of an RT 1100RT, and with the top case on the back, I do have to say that I was never uncomfortable. The bike is stable and heavy enough that I could move around and change position, and not bother Bob, who was driving. With the top case and the two hard side bags, there was plenty of packing room. So, in terms of motorcycle touring, the BMW RT would have to be classified as one of the Best Sport Touring Motorcycles, no doubt about it! At slightly under $13,000, the Yamaha FJR 1300 is potentially one of the Best Sport Touring Motorcycles, particularly when talking about value.. This motorcycle also comes in a FJR 1300 AE model, with a seemingly effortless electronic clutch, operable by a foot pedal or a bar-mounted paddle. (essentially, an automatic shifting motorcycle) Whether this option was intended to attract women motorcycle riders is unclear to me, and it is one that I would in all likelihood forgo. With a seat height of 31.5 to 32.3 inches, a dry weight of 593 pounds, and a compact front faring, this motorcycle might actually be a hit with woman riders. My motorcycle man is of the opinion that this motorcycle is aesthetically more pleasing than the Honda ST 1300, especially when the side bags are removed. 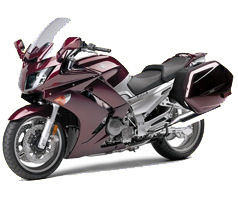 Like the Honda, the Yamaha only comes in one color per year - the 2007 model being the black cherry color in the above picture. Another one of the Best Sport Touring Motorcycles? Probably. Not surprisingly, the European motorcycle manufacturers have their share of pretty nice sport touring bikes. Straight from the UK, the Triumph Sprint ST is a handsome alternative to the japanese sport touring motorcycles. With a 1050 cc displacement, seat height of 31.7 inches and a dry weight of 462 pounds, coupled with an aerodynamically proportioned front end, this motorbike is certainly in my top five. I saw quite a few of this while we were in England and Scotland, and each one made me turn my head. What is most surprising, given the current exchange rate and the dismal performance of the American dollar versus the pound, this motorcycle is an amazing value at a little over $11,000 loaded. Price alone would have to qualify it as one of the Best Sport Touring Motorcycles - right? Other than the fact that this sport touring motorcycle is not safely parked in my garage, there is nothing that I don't like about this Moto Guzzi sport touring Norge. A six-speed, 1151 cc, air-cooled, V-twin, this beauty is certainly one of the sport touring motorcycles that should be considered by anyone wanting to tour in comfort and style. A seat height of 31.5 inches, and a dry weight of 542 pounds makes this bike one that should be on the list of any woman rider wanting to add an European influence to the American roadways. The only negative that I can think of (and I had to ponder for a while) may be the difficulties that an American might have in getting this baby serviced. Other than that, I highly love this sport touring motorcycle. Yep, the Norge definitely can be classified as one of the Best Sport Touring Motorcycles. Definitely. Last, but not least, the Ducati ST3 sport touring motorcycle - this bike for sure on my top 5 list of Best Sport Touring Motorcycles. 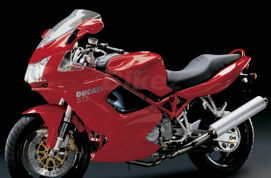 A well-maintained Ducati, in top mechanical condition, has to be the motorcycle of all motorcycles. Although historically not as reliable as a BMW or a Honda, this is a beautiful and extremely fun motorcycle for touring and twisty roads. With a 992 cc displacement, and a relatively light weight of 447 pounds, this is a motorcycle built for women motorcycle riders. I have ridden this bike, and it is supreme, especially in the curves. What you are sacrificing is reliability, unless you are a motorcycle mechanic. If you opt for a Ducati sport touring motorcycle, make sure that you have it serviced religiously and regularly. 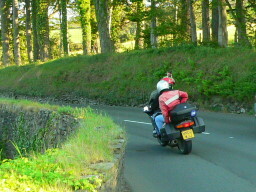 Then you'll be touring on one of the Best Sport Touring Motorcycles with a smile on your face. And where will you be wanting to ride that new Ducati? How about the ultimate in "Great Roads for Motorcycling"?